In the market there are products that are made special for men, although there are products that are for women but also used by men. In this article we limited our topic to men body care products. We asked as many as 513 male respondents of all ages and locations throughout Indonesia. Through this survey we wanted to deliver some of the top or most preferred brands of men body care products along with some other details. There are obviously types of body care products, and we categorized them into ten types. Of those ten types of body care product for men, we asked our respondents which one(s) they use. 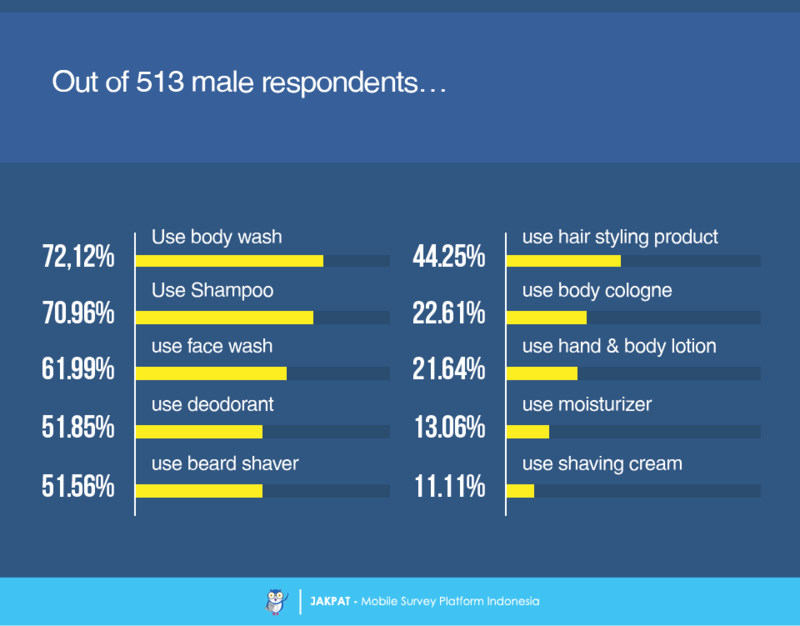 Sitting on the top body wash was voted by 72,12% of respondents for being the number one used men body care product. 70,96% of respondents voted for shampoo, sitting after body wash. 61,99% voted for face wash. 51,85% voted for deodorant. 51,46% voted for beard shave. 44,25% voted for hair styling product. Next is body cologne, voted by 22,61%. 21,64% voted for hand and & body lotion. 13,06% voted for moisturizer. Lastly on number 10, 11,11% voted for shaving cream. The order above may show or indicate the level of necessity of having and using the products in daily life for men. The results may be different if the same questions were asked specifically to women or female respondents. 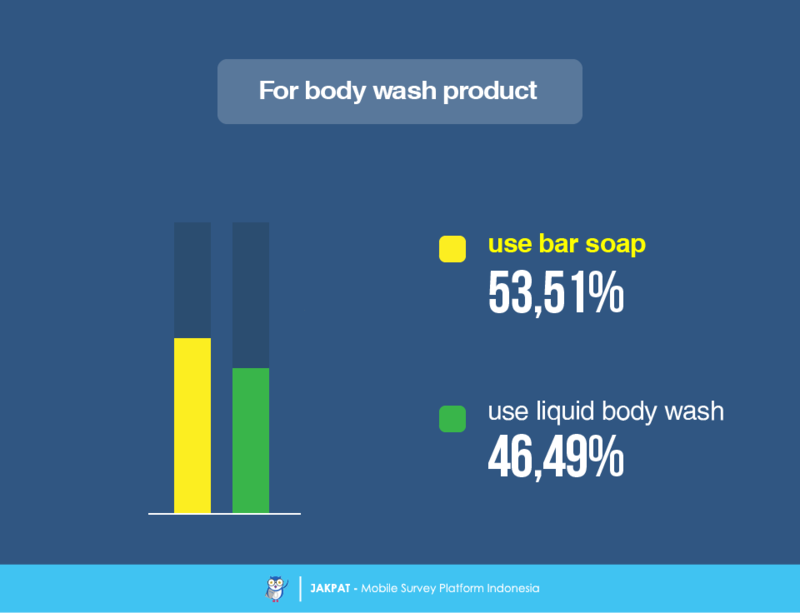 For the type of body wash, the majority of the respondents prefer bar soap (53,51%) to liquid soap (46,49%). 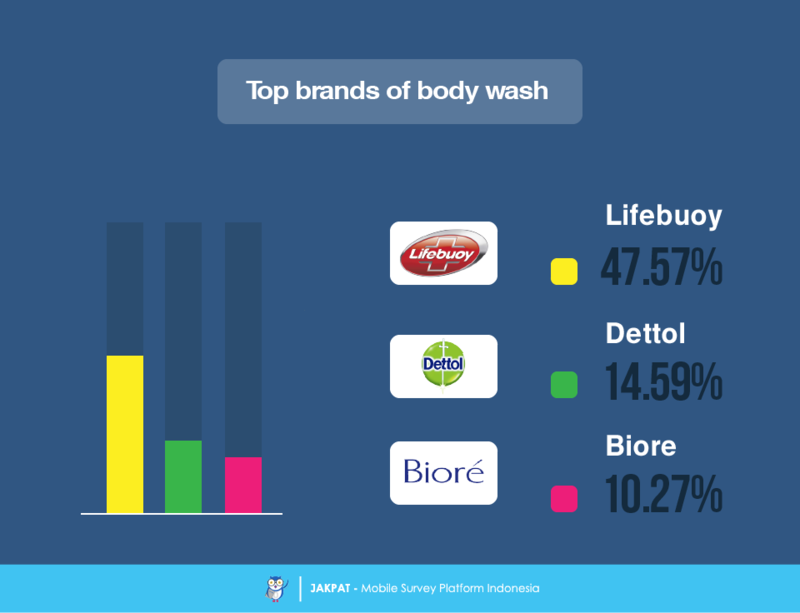 As for the brands of body wash, 47,57% of the respondents claimed to using Lifebuoy, 14,59% use Dettol, 10,27% use Biore. Those are the top 3 brands for body wash. The rest of the results includes Lux (8,92%), Gatsby (5,68%), Nuvo (4,59%), Dove (4,05%), Asepso (0,54%), and Master (0,27%). 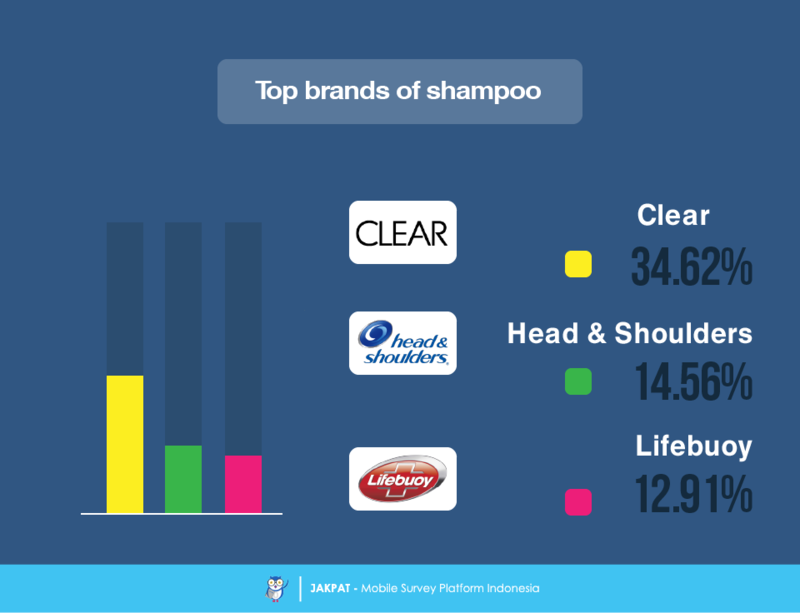 Moving on to top brands of shampoo, the majority of the respondents claimed to using Clear (34,62%), followed by Head & Shoulders (14,56%), and then Lifebuoy (12,91%). Some other brands that did not make it to top 3 include Pantene (11,54%), Sunsilk (7,69%), Dove (5,49%), Zinc (4,12%), TRESemme (4,12%), and Rejoice (3,85%). 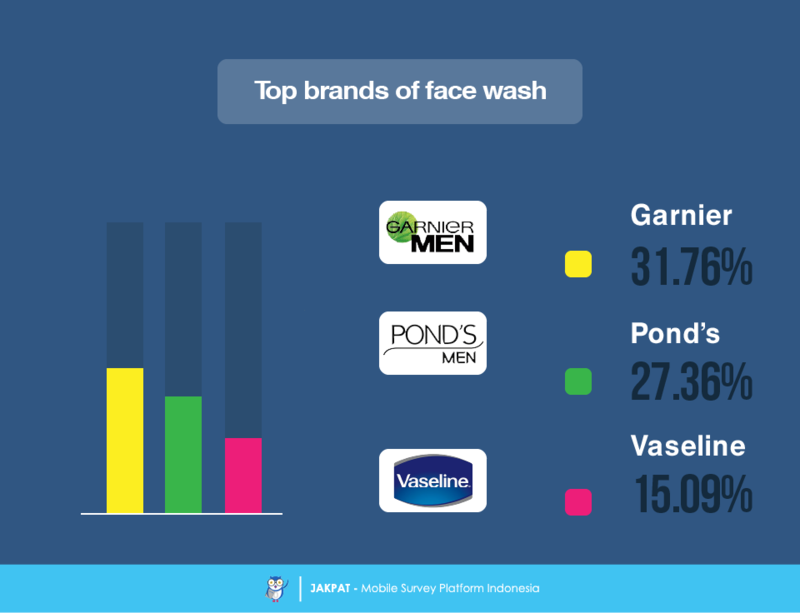 Now we are moving on to top brands of face wash. Garnier sits on the top with votes from 31,76% of respondents. Number two belongs to Pond’s (27,36%). Number three belongs to Vaseline (15,09%). The rests are Nivea (11,01%), Biore (3,45%) and L’Oreal (3,14%). 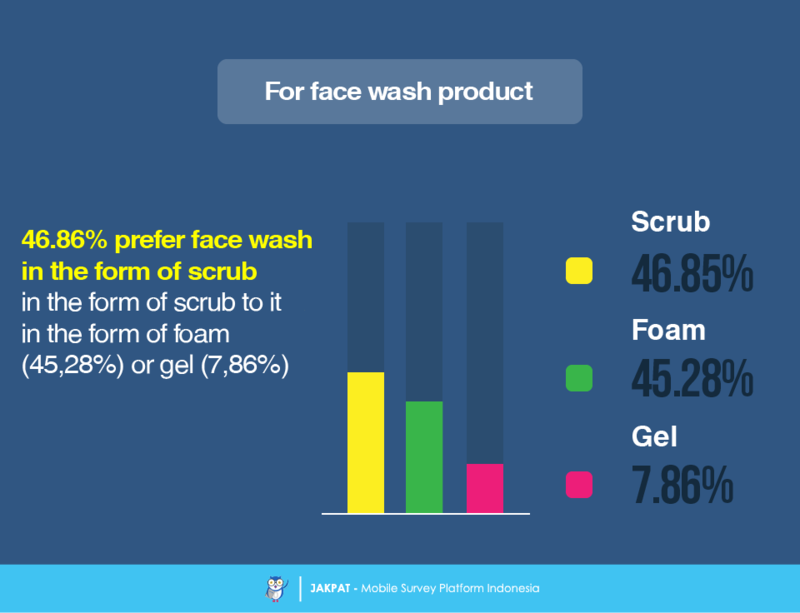 Still speaking of face wash product, the majority of the respondents admitted to preferring face wash in the form of scrub (46,86%) to it in the form of foam (45,28%) or gel (7,86%). 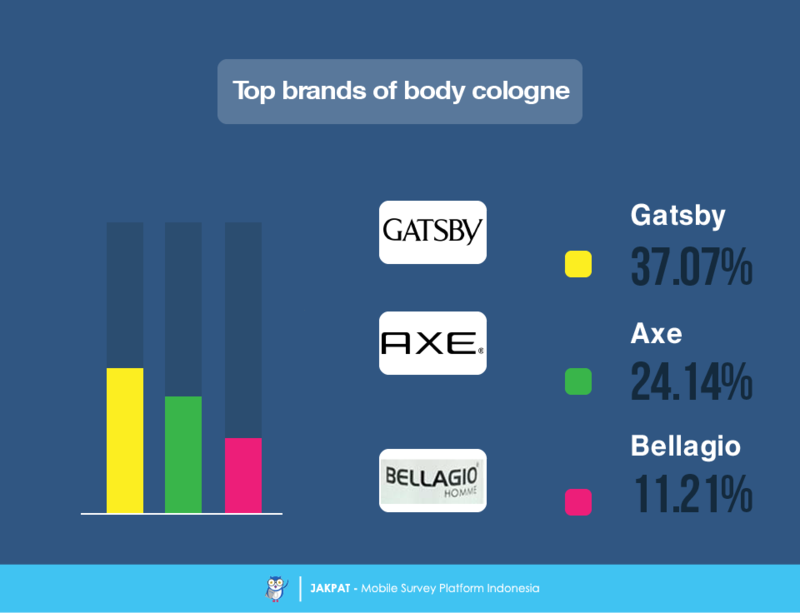 For body cologne top three brands, we have Gatsby sitting on the top (37,07%), followed by Axe (24,14%) and Bellagio (11,21%). The rest includes Casablanca (7,76%), Adidas (6,03%) and Master (5,17%). As for the form of body cologne, spray form was voted to be the most preferred one (71,55%), while liquid form seems less preferred (27,59%). 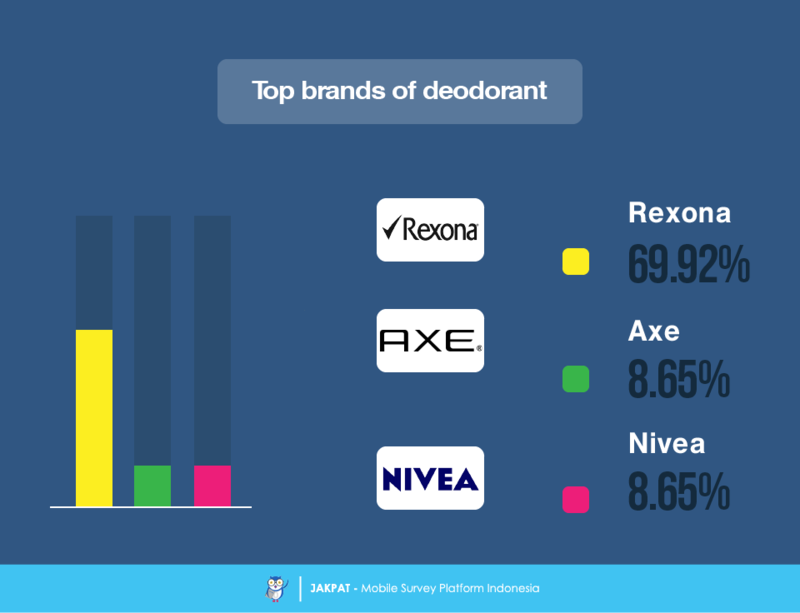 Moving on to top brands of deodorant, Rexona sits on the top (69,92%), followed by Axe (8,65%) and Gatsby (6,39%). The rest includes Nivea (4,14%), Casablanca (3,76%) and AXL (2,63%). Next type of men body care product is hand & body lotion. 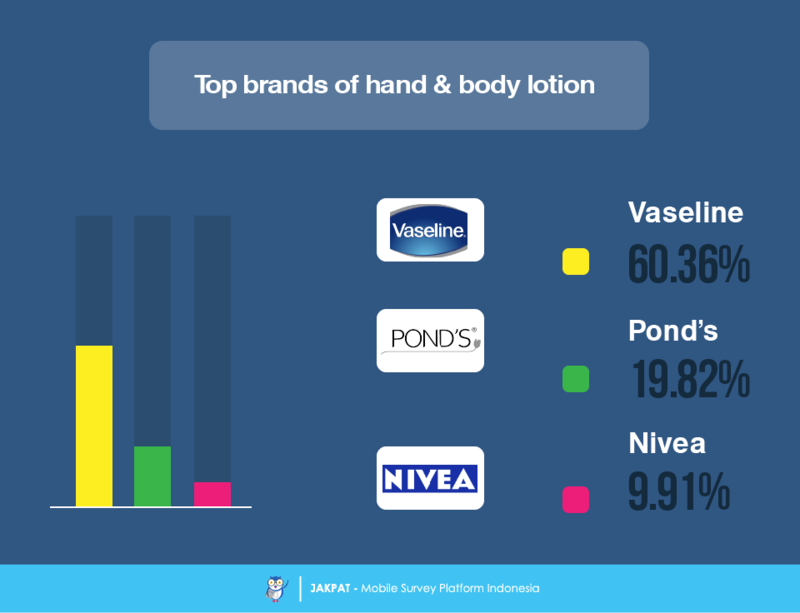 We have Vaseline on the top (60,36%), Pond’s (19,82%) and Nivea (9,91%). There is an interesting finding, though. As we only asked about products that are only specific for men, in this hand & body lotion category we found that 8,11% of the respondents wrote Citra, a more feminine hand & body lotion product. Moving on we have hair styling product category. 38,77% of the respondents claimed to using gel type of hair styling product. 30,4% use pomade. 18,06% use wax cream. Lastly, 12,33% use soft cream. Still in the category of hair styling product, now we have the top brands. The majority of the respondents claimed to using Gatsby (85,44%). 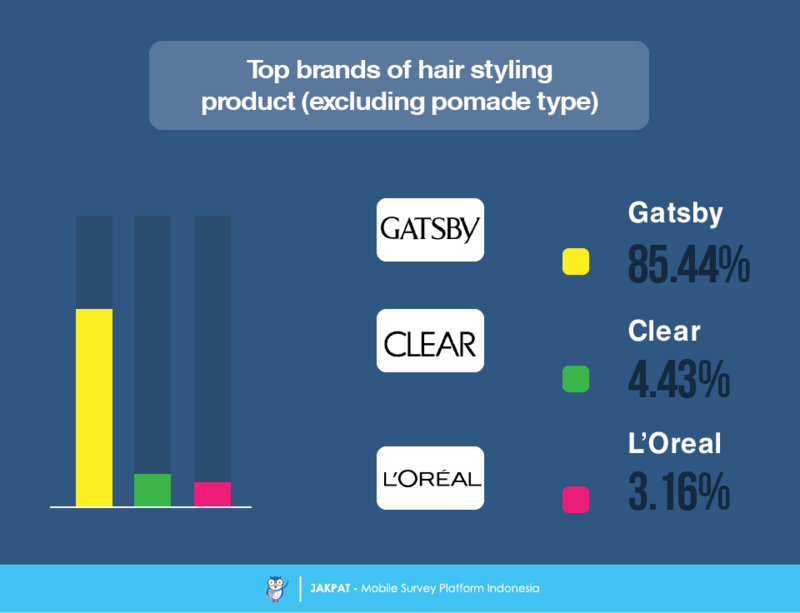 Following that we have Clear (4,43%), L’Oreal (3,16%), Tancho (2,53%), Rudy Hadisuwarno (1,9%), Brylcream (0,63%), Orang Aring (0,63%), Murray’s (0,63%), and Johnny Andrean (0.63%). It looks very clear how Gatsby brand rules the market. 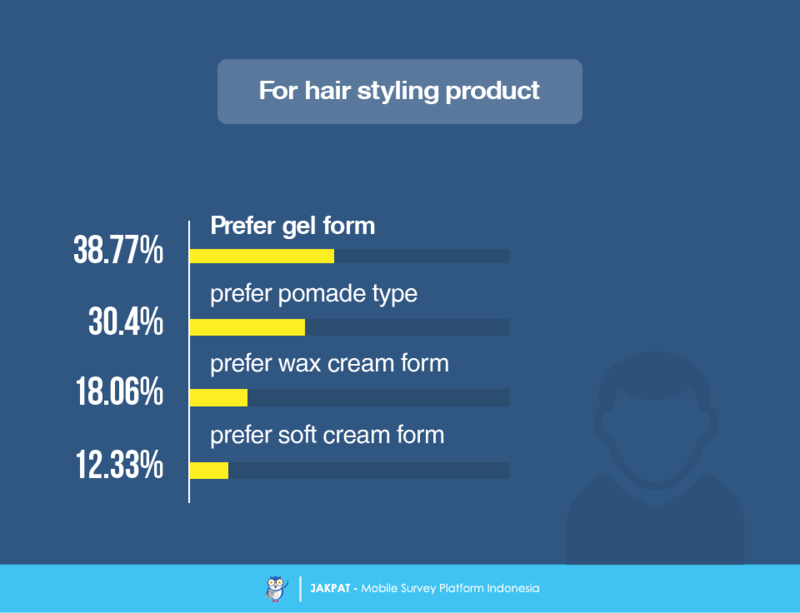 Still in the talk of hair styling product, we asked our respondents who claimed to using pomade type of product. 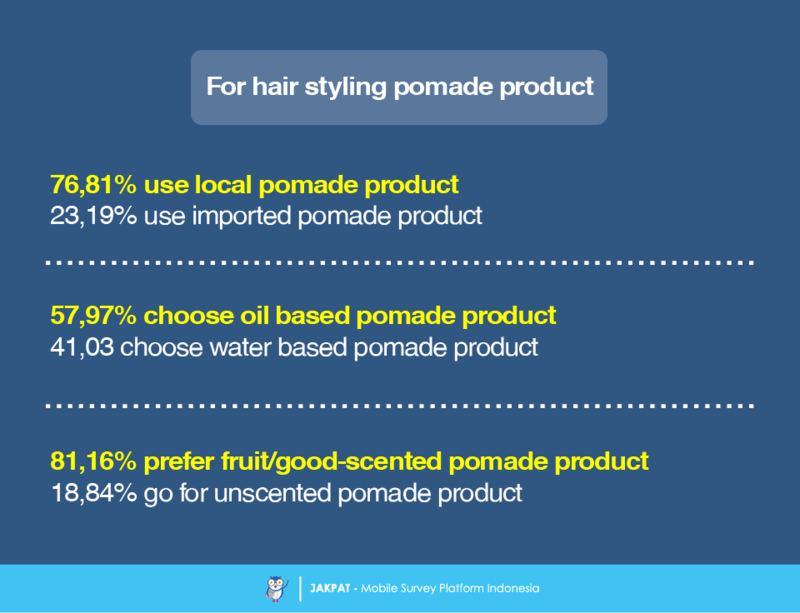 76,81% of the respondents claimed to preferring local made pomade to imported one (23,19%). And as for the basic material for the pomade, 57,97% admitted to using oil based pomade to water based one (42,03%). Lastly, we found out that 81,16% of the respondents prefer fruity or generally good scented pomade to unscented one (18,84%). 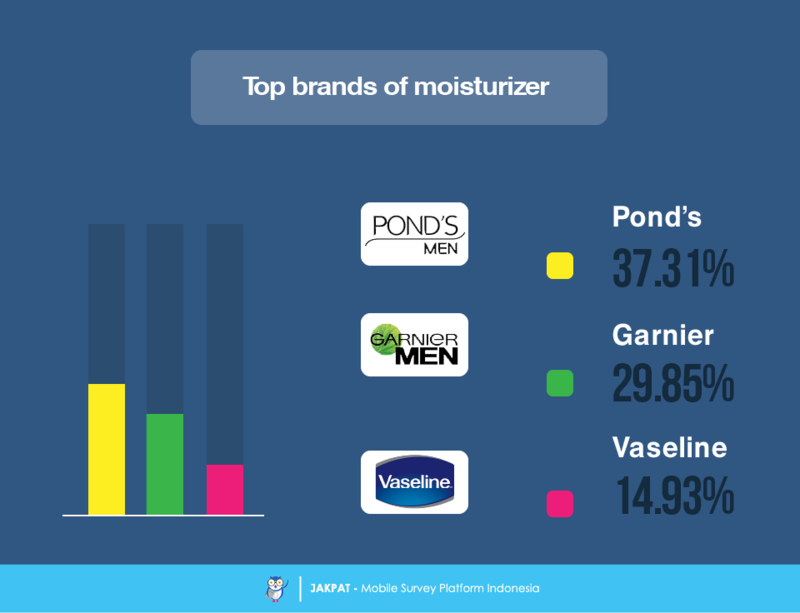 As for moisturizer, we have Pond’s on the top (37,31%) then followed by Garnier (29,85%), Vaseline (14,93%), Nivea (8,96%) and L’Oreal (4,48%). 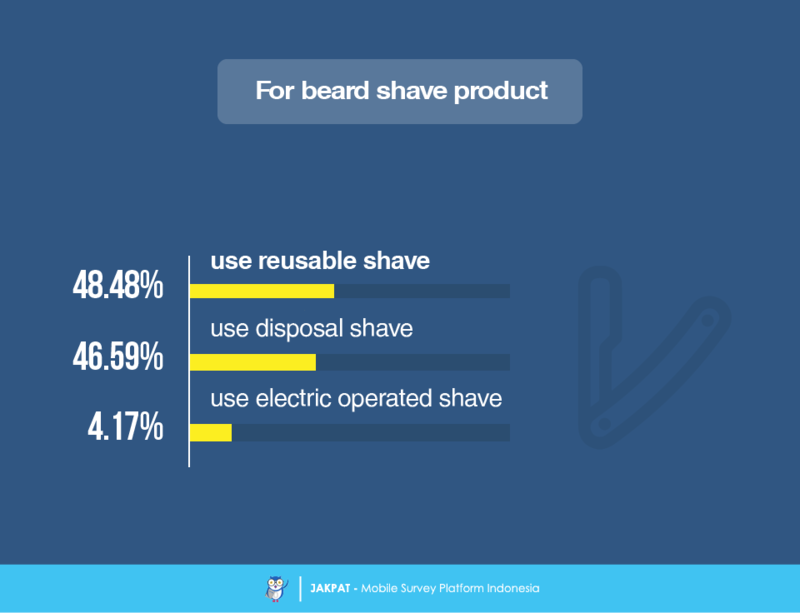 Moving on to beard shave, 48,48% of the respondents claimed to using reusable shave as opposed to disposal one (46,59%) or electric/battery operated one (4,17%). 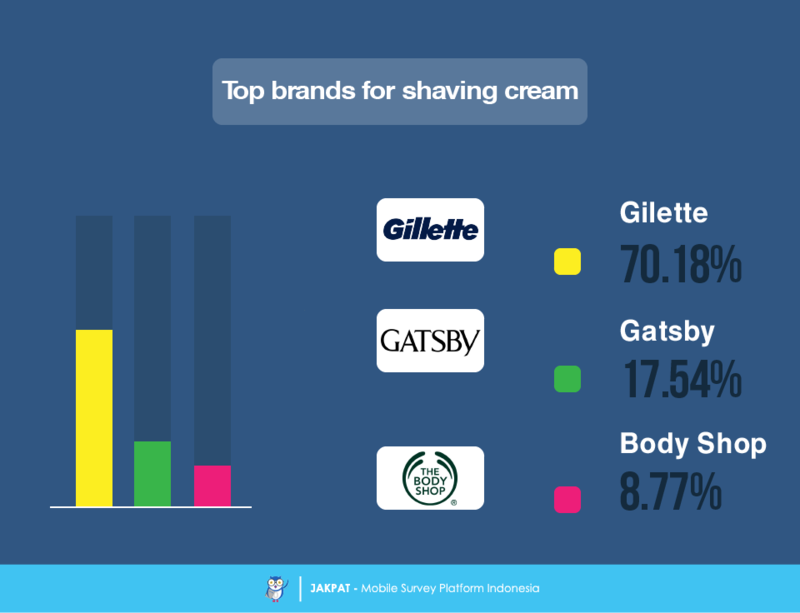 As for the top brand Gilette seems to be the obvious one as voted by 94,7% of the respondents. Now to end the article we have shaving cream. 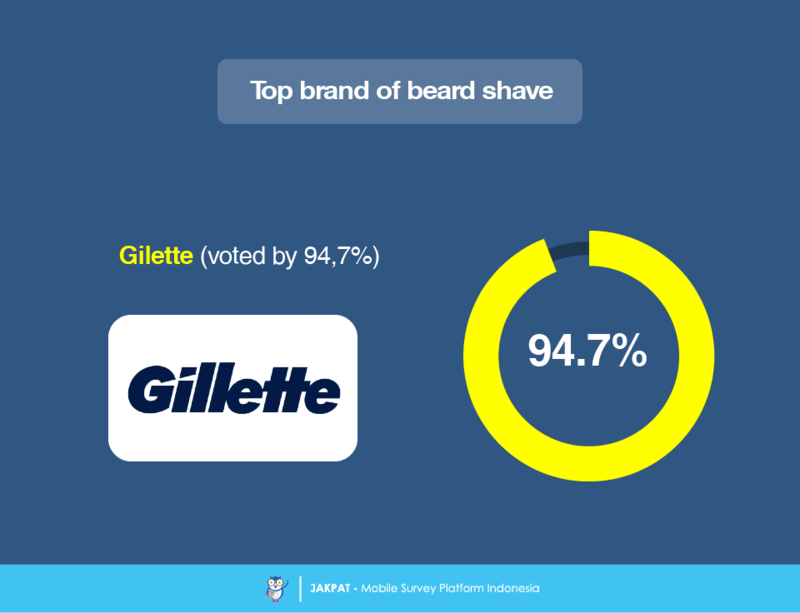 Gilette has been voted to be the number one most used brand for the category (70,18%). Next are Gatsby (17,54%) and Body Shop (8,77%). This entry was posted in Health, Lifestyle, Personal on April 21, 2016 by Raditia Sujanto.